metal eyelet is used for garment,jacket,bags,belt, shoes,boots, or tent, banner, tarpaulin. There are more than 60 workers and 4 researchers to design and development here. We has gained IS09001 , SGS certificates and obtained patents by self dependent innovation . We have ISO 9001, SGS certificates and obtained patents by self dependent innovation. THE METAL EYELETS BASIC INFORMATION Item 20mm Customed Engrave Logo Brass Eyelet For Clothing Material Brass/Iron Color Green Size 20x4x8mm/as your request MOQ 5000 set Logo N/M orupon your request Technology Painting ,Plating ,engraved Sample Free if in the stock,but freight paid by the buyer Payment 1. T/T, Paypal for small order 2. 30% down payments,70% before delivery for bulk order DELIVERY TIME Sample About 3 days Mass Productions 7-15 working days after confirming order OUR ADVANTAGES Price Direct f actory price Quality The most excellent quality with over 15 years r eliable and experienced manufacturer Production 1, Eco-friendly, Nickle&Lead free,we have BV certification 2,Won't change color and rust 3,Design the productions as you like ,ODM and OEM are welcome Lead Time Short time ( 7-15days ) After-Sale Service Provide &ldquo;7 &times; 24h&rdquo; service MACHINE: Note: All of our products can be customized . You can choose the sizes, materials,shapes, colors,logos what you want . Before quote you the price,we will be appreciated if you can provide the information below: 1.Material & Size 2.Color & Quality 3.Quanlity 4.Product image (you like) If possible ,pls provide the above information to us ,if you are not clearly, we will give you the best advice according to your requirement. They are the property of their respective owners, and we are not authorized to sell items bearing such trademarks. ,Ltd Established in the year of 1980 and having been in business for 34 years, Foshan Sanshui Xinda Hardware Co. Our 20,000m 2 factory and staff of 400 enable us to produce 60 million units monthly. 3.May I have new sample with our LOGO for confirmation 9 Yes ,of course you can . 4.What about the lead time 9 It depends on the product ,if handmade ,it needs a little long time . Normally 7-10 working days after confirmation of design and remittance . Metal Curtain Ring Metal 20mm Eyelets 1. factory direct sale 2. competitive price 3. high quality 4. 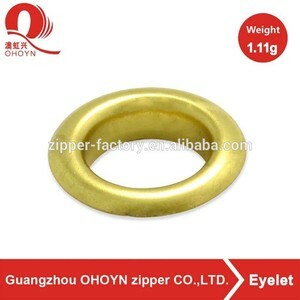 20mm Eyelets Metal Curtain Ring Metal 20mm Eyelets material:brass size:5mm-20mm or customized color:silver,nickel,gold,anti-brass payment:paypal,western union,TT sample:acceptable pacage:100pcs/bag Product show of Metal Curtain Ring Metal 20mm Eyelets Welcome to visit our factory! High End Matt black Metal Eyelets Grommets,25mm Flat Eyelets Metal Eyelet for Shoes We,prefessional zipper & button manufacturer ,owned our own slider open-mould workshop ,also can supply many nice available model for your choices ,if you are looking for luxury garment ,suitcase,bag etc accessories ,YYX will be your better partner ! Let's going on for more details . 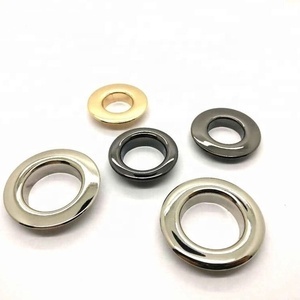 25mm flat eyelets description: Brand YYX or OEM Item 25mm flat eyelets Material Zinc alloy/Brass /Iron/Aluminum Size 12mm,15mm,17mm,18mm,20mm,22mm,25mm Material Zinc alloy in special shape like the picture showed Color Customized,such as anti-brass,anti-nickel,hang electric golden ,sliver etc Logo lasered logo/painted logo /silkscreen logo /engraved logo MOQ 50gross(Sample orders are acceptable) Remark: Prompt delivery+high quality finish Available in different size, color,shape,logos,OEM designs are 20mm flat eyelets sample pics: Flat eyelets features : 1.Good feeling-look and touch,100% eco-friendly material ,green material, non- toxic ,harmless to body, durable; 2.Customized designs and sizes are welcome; 3.It can be used for garment,handbag ,clothing, suitcase,backpack,etc ; 4.Fast sampling and efficient services; 5.High quality, reasonable price and fast delivery time. etc ( As per clients' request ) OEM Accept MOQ 100000 sets Sample Samples are free if we have in stock. Delivery time 10-15 working days after confirmed order Payment term T/T 50% as deposit, 50% balance should paid before shipment. Package Inner packing is poly bag, outer packing is carton. Item No. 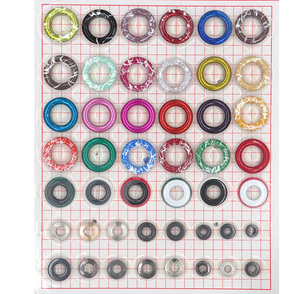 #24 fabric covered eyelets Size Can be customized Technic The grommet with eyelets is made in the method of punch molding with iron/brass/aluminum as raw material. The bottom surface can be plated, it can be customized to be plated with nickel, zinc, white brown, imitation gold, black brown. Then to be covered by moulds with fabric/leather. 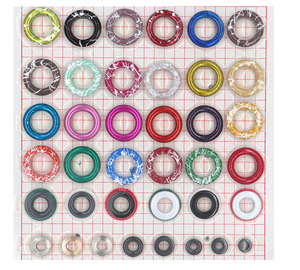 Foshan Zhicheng Metal & Plastic Accessories Products Co., Ltd.
Alibaba.com offers 870 20mm eyelets products. About 16% of these are punching machines, 12% are garment eyelets, and 1% are curtain poles, tracks & accessories. 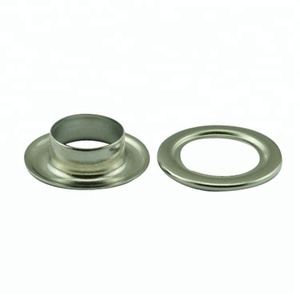 A wide variety of 20mm eyelets options are available to you, such as brass, zinc alloy, and iron. You can also choose from round, oval. As well as from free samples, paid samples. There are 790 20mm eyelets suppliers, mainly located in Asia. 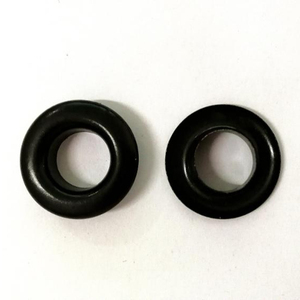 The top supplying countries are China (Mainland), Russian Federation, and Hong Kong, which supply 99%, 1%, and 1% of 20mm eyelets respectively. 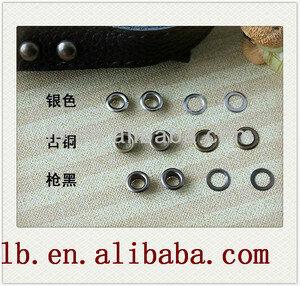 0mm eyelets products are most popular in Southeast Asia, North America, and Domestic Market. You can ensure product safety by selecting from certified suppliers, including 133 with ISO9001, 68 with Other, and 36 with ISO14001 certification.